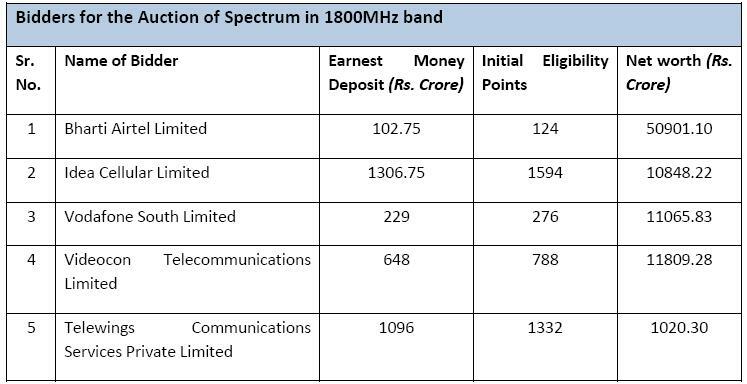 India’s Department of Telecommunications (DoT) today issues final list of bidders for 1800 MHz GSM Spectrum Auction. There are only five players Airtel, Vodafone, Videocon, Idea Cellular and Telewings (Telenor -Uninor) left in the race for GSM spectrum. There are no bidders left for 800 Mhz CDMA spectrum as Tata Teleservices (Tata Docomo CDMA) and Videocon Telecomminications withdrawing thier application as earlier we shared on TelecomTalk. Tata Teleservices had applied to participate in the auction for CDMA spectrum in three circles. Videocon, the only other applicant for CDMA spectrum in 10 circles, has already withdrawn from the auction. Another CDMA operators Reliance Communications (Rcom) and Sistema Shyam (MTS India) have already stayed away from the auctions entirely. With this new development in CDMA segment MTS India could gain from this. The exit of Videocon and Tata Teleservices could strengthen its argument that its licences should be restored since it had applied for CDMA spectrum for which there was no demand. Sistema Shyam Teleservices (SSTL – MTS India) ‘s licences were canceled by the Supreme Court along with those of other players given 122 licences in 2008 in its 2G verdict. The 2G spectrum auction is to take place on November 12 and the final list of bidders to be announced on November 6. This will be followed by a mock auction on November 7 and 8 and thereafter the e-auction of 1,800 MHz band will take place on November 12. Another interesting thing is that, now Only 5 bidders remain for GSM auction so incumbent operators like Bharti Airtel, Vodafone and Idea Cellular can easily mange or try that auction to get over at a low bid price because they have to pay a one time spectrum fee based on the final bid price in this auction, at the time of renewal of their 20 years old Pan India 2G GSM spectrum. Will Uninor continue their service in INDIA?